The Princesses and Pirates’ Party at the Showboat Branson Belle is one of fascinating Branson attractions that is ideal for kids as they can experience an adventure like no other aboard the paddle river boat cruising Table Rock Lake. As you hop in the river boat, you will meet the showboat’s very own belles of the ball and jolly first mates, dozens of fairy princesses and pirates. During this enchanted tour, you will feel a unique travel experience that is filled with opportunities for interaction, including photos, hugs and high-fives. Your cruise adventure with the Showboat Branson Belle begins on the top deck with fun-filled activities including a ballroom artist, bubbles and a Princess & Pirate Dance Party. As you take your seat, you will be entertained by Pirate Magician Aaron and the boat’s beautiful Princess Cassandre, that brings fairy tale songs to life. The party includes full course meal fit for a little king or queen with a brand-new menu. 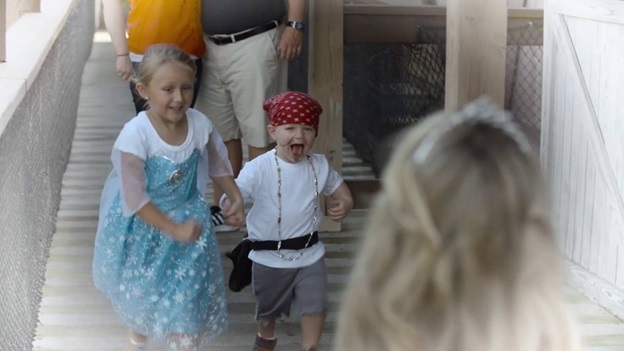 This Princess & Pirate Dance Party features kids menu that includes Celery & Carrot Sticks with Ranch, Nathan’s Famous Hot Dog, Fresh Baked Roll, Mac & Cheese, Applesauce, ‘Dirty & Worms’ Ice Cream Sundae and Choice of Beverage. Adult menu includes Green Salad, Fresh Baked Roll, Chicken Caesar Wrap on a Tomato Basil Tortilla, Pickle Spear, Potato Salad, World-Famous Silver Dollar City Apple Cinnamon Ice Cream Pie and Choice of Beverage. As the Showboat Branson Belle sets sail this summer on a swashbuckling adventure like no other, Princesses and pirates alike are invited to board on this beautiful river boat. Every Sunday, starting from the second week of June through first week of August, children are invited to dress up as their favorite princess or display the eye patch of a pirate as they are entertained by the royal court and a swashbuckling bunch of scallywags. Your cruising experience with the Showboat Branson Belle always includes a meal, a top deck dance party and live entertainment from Pirate Magician Aaron and Princess Cassandre. Princesses and Pirates’ Party in a Showboat is a new production show this summer and it presents three special “Princess & Pirate” cruises in July and August, designed to give young fans of princesses and pirates stories an opportunity to dress-up and join in. As the headliner at Showboat, Cassandre Faimon-Haygood brings fairy tale songs to life and magician Aaron Radatz showcases “pirate magic” on the cruises, which are offered at 11 am on Sundays. Party activities include meet-and-greets with 10 princesses and 10 pirates, kids’ crafts, balloon artists and a dance party on the top deck of the Showboat. The finale act on this cruising experience with the Showboat is a Princess & Pirate Dance Party on the top deck with fun-filled activities such as tiara making, princess and pirate stick-on tattoos, balloon artistry, bubbles and more. Showboat Branson Belle is one of the best Branson attractions during summer season as the Princesses and Pirate’s Party on the showboat gives kids the chance to experience an adventure like no other.